Many have followed their dreams to Carrot Ranch. It’s an imaginary place for real people who bring with them a thousand different writing dreams. Each person has their own sack of stories sprinkled with star dust. Readers will notice a new format, including carrots. As our Ranch grows, so does the collection of weekly flash fiction. The stories will be divided into parts of 20 (or less for the final part). It takes 10 minutes to read 20 flash fiction, according to the average reading time of 200 words per minute. Each collection is artfully arranged, so look for connections or contrasts that might surprise you. 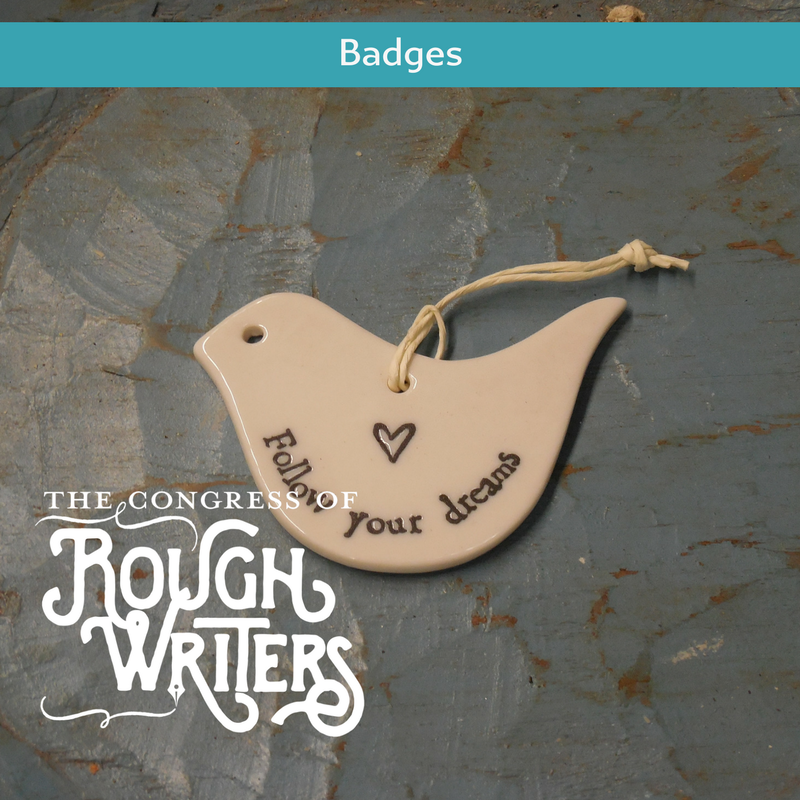 The following is based on the March 22, 2018, prompt: In 99 words (no more, no less) write a story using the theme “follow your dreams.” Bonus points for throwing a badge into the tale. At three Joy dreamed awake, sitting on her grandmother’s lap, listening to stories about brave little girls. She spent hours on Alpine cliffs with Heidi; in Mary’s secret garden; in Jo’s cozy New England cottage. When she grew older she learned to read, escaping home often. Some said she daydreamed too much. Her mother sometimes startled her home yelling, “Snap out of it!” She came back, but never stayed long. Joy would not relive the hopelessly fettered life that made her mother mad. She promised herself: to read, to forever follow her dreams, and to write her own story. and stayed in streets filled with doubts and litter and had thus always been angry and bitter. Her son was different. He chose diligence and knowledge over greed and ignorance. He faced down the bullies and the corrupt and moved out of the sewers. Now Violet’s two grandchildren have seen orchards and apple blossom. Skies unfurled blue every morning of their youth. Like their grandmother, what they saw moulded them into what they are. But they can now follow their dreams. The girls talked shoes and shopping, so I ran with the boys. Till they obsessed on cricket and football, and I walked alone. Why did girls paint their faces and fuss with their hair? Why did boys get drunk on swagger, beer and playful punches? Neither camp suited me. “I’m following my dream to shake off the shackles of gender.” Gonna get me a badge: I’m Sam and my pronouns are they and their. I did it mum. I took your advice. Born at a time where a good Indian wife and mother was nothing but that, my mum had dreams of being a doctor. Instead she was married off early, and, well, no one was going to encourage their daughter in law to study more, or, God forbid, work. The applause carried her right through the week. She recalled the cheeks flushed with pleasure, and eyes although bright with tears in some faces, shone with delight. Tears appeared in her own eyes now, bittersweet. She had followed her dreams and studied hard to become the dedicated nurse she aspired to be. Yet, she ached to fulfil another need. Playing with words had always been a favourite pastime, and the poem she had written to cheer up her cancer patients brought the house down. Laughter certainly is the best medicine! They invaded his waking thoughts, tormented him as he slept. He didn’t understand, couldn’t fathom what he was supposed to do, where he was supposed to go. Come to us, come to us. He tried to question them, ask them how, when and why. You will know, you will know. She too had heard the calling to follow. He had been in her dreams, was her dream. Their ideas intertwined and enhanced each individual thought. They recognised their destiny as each other, and together became their dream. Looking across the bar that night, I saw him. The man of my dreams. He was tall, gorgeous, and he was looking at me. I just had to find a way to meet him, but I wasn’t quite sure how to go about it. He was with a bunch of people and left the group to go to the washroom. It hit me, I’d go talk to one of his friends. I introduced myself and asked, hey is your friend single and can you introduce him to me? That was 32 years ago, and we’re still happily married today. Terry had met his match, Louise was everything he wanted in a partner but she had never been sailing. Would she support his dream to build a boat and sail the high seas. She was wobbly on the hired catamaran but could see his passion so agreed to spending their savings and spare time building the boat of his dreams. Frankly she thought he would tire of the task and they could soon settle to an ordinary life. Two children later they’d sailed to Barbados and had lived on board for a year collecting a badge in every port. It had been the perfect honeymoon. We enjoyed endless days swimming, relaxing and drinking cocktails. Barry announced that on our last morning, my dream of diving the reef, would finally be actualised. We were going scuba diving! I plunged into the water, closely following the directions from our devastatingly gorgeous instructor. I became lost in the magic of the world underwater when I suddenly found myself alone and my tank empty. Barry and the instructor were gone! As I succumbed to the lack of oxygen, my puce coloured face realised the fiction on which our marriage was truly conceived. She’d fallen for him, hook, line and sinker. She faintly remembered her mother’s warning about mixing with the wrong sort, but she’d been dreaming of his alluring, bewitching beauty ever since she’d set eyes on him, and if you don’t follow your dreams, are you even alive? Unable to resist his magnetic pull any longer, she rushed to become one with him. And as soon as her lips touched his, she felt a fierce tug….as the hook sank into her mouth, and the fisherman quickly reeled her in, along with the crayfish that he was using as bait. I lowered the binoculars. A sip of coffee did nothing to wash down the taste of my failed past, nor did it dissolve the knuckle-like mass growing in my stomach. The name had meant nothing, uttered from the brown suede chair in my Brooklyn office; just another unfaithful spouse of the rich and famous. The customary exchange of yellow envelope and stale cigarette smoke on hand had followed. Married name. It seemed obvious now as the thought whirled through my head. Follow your dreams, I thought bitterly and settled in to spy on my ex-fiance. Once upon a time there was a rather bright cat with a rather dull brother. Vowing to follow his dreams, he began an epic journey, until he detected the pitter-patter of cat feet behind him. “Go home!” he meowed at Mr. Dull. A kind human heard his cries. Now they live in a mansion, have a cat door, and wear badges on their collars. Sometimes loud triumphs over brilliance. Michael stood in the middle of the grounds of Dublin Castle. Around him there was a sea of rainbow flags, gay couples kissing and allies smiling. The date was May 22nd 2015 and though Michael had never been in a relationship, today ensured that he could follow his dream of marrying in his country and having his marriage recognised someday. As a young gay man, he never thought it was possible. He just imagined the closest he’d come to marriages and all that jam was as his straight brother’s Best Man. But today, that changed and it was wonderful. She observed the monarchy presenting her boy the Victoria Cross. Corporal Trigg-Ashworth had served 12 years: 3 months: 4 tours. He had seen things only dreamed up in the darkest of nightmares; regrettably had done worse. He stood to attention as the bronze emblem was pinned to the right of his uniform. He’d trailed in his father’s footprints; he would have been proud. Honourably discharged, it was time for her son to now follow his own dreams. Keeping head held high, walking stick in hand, he’d earned his badge of honour; for valour, for country, for both of them. Lotta Du Charms relished the feel of canvas around her legs, leather and horseflesh between her thighs. She’d spent her orphaned youth working in Lula’s saloon. When she’d traded her downstairs housekeeping badge for a “bed-making” badge upstairs, it was under Lula’s protection and loving ear. Her choices were respected, any door opened never permanently closed. Lula was wise that way. Lotta’d left after midnight, Goddess Moon hanging full-bellied in the Oklahoma sky. Her purse was heavy, her shotgun loaded, knife glinting in her boot. “Onward, Artemis,” Lotta whispered to her horse. They set off to the next horizon. Husband stretches and wraps an arm around me. “I’ve got to go,” he coos. “Choir rehearsal this morning.” Surprised, I check my calendar. Jean was stumped. Finally, her words came. So Jean professed her calling, her dream. The voice on tv seemed to be talking directly to Tim. He really needed a reason to keep going. This woke up something inside of him. He ran to the closet that still held some of his ex-wife’s clothes. He put on a dress and high heels. Then he put on his grandmother’s brooch and wore it like a badge of honor. For the first time, he felt whole and complete. Jane jerks awake, the dream still strong. She’s scraped her fingertips against the rough concrete floor before she remembers there is no lamp. No bed, no matching nightstand, no electricity at all. Just her sleeping bag on the cold floor of the abandoned house she squats in. The dream had felt so real. Safe in her bed. Her roses outside the window. Her house. Follow your dreams, they said; it makes life rich. Except when you end up losing it all. She’d moved here with such high hopes. Now she knows that sometimes what’s over the horizon should stay there. Marnie snuck into the back row. The ceremony was underway. “Follow your dream” and “What is your dream?” were displayed on the large screen above the stage. As each graduating student took the microphone to share their dreams for the future, images of past achievements were projected onto the screen. Marnie should have been there too: but what could she share? Who would listen or even care? Only Miss R. Marnie craned her neck for a farewell glimpse, then left as quietly as she had entered. Once she had escaped her nightmare, perhaps then she could begin to dream. Craft time was underway when Marlie arrived. Though unsure what the others were making she quickly got herself some sticks and yarn too. Her thoughts swam in the colorful weave of her careful work. Marlie paused, then loosened the yarn, undid each wrap and weave, dismantling her creation. At a time when kids her age where scratching their heads and biting their nails trying to solve simple additions and subtractions, Sheena Bora had moved onto asking probing questions on higher order trigonometry and suggesting ‘out of the box’ answers to complex albegriac equations that stumped her teachers including her father, an acclaimed Professor of Mathematics, no less. It was another matter that with the onset of puberty, her interests spilled over and soon, aided by an increased hormonal overdrive, she found herself spending equal time nourishing both her mind and body. It came as no surprise when her top cat status helped her in bagging a prized seat at Cambridge and by the time she moved onto to greener pastures she had a panting bunch of heaving, panting, salivating Lotharios. Do writers lean towards mendacity? Lunging with vocabulary, imagining everyone will fill in the gaps, while they blush in the shadows at their cleverness? Do writers call the unattainable goals they follow dreams? And yet some dreams do come true. Words end up in print. Others spy through internet glasses and peak at the peacock preening. It really isn’t that way is it? Fiction isn’t fact, though there might be some threads of truth. And even a peacock needs to eat, and showing off does get some attention. Writers are people too. Please show em some love, won’t you? From an early age, he started drawing things. He showed a liking for patterns. As he grew, he played more and more with line and form. When his schooling was over, he had decided to become an artist. He worked on his craft, he was invited to exhibit his work. He found a market, a worldwide one. He discovered his choice of colour, his blue and white. Today he follows his dream, lives off his art when he doesn’t need to borrow from his dad. Soon he will travel the world, firstly to Singapore to display his beautiful work. It’s not exactly a badge but a sample of his work. Abby followed her dream to the edge of a field filled with thorny weeds that twisted like ivy. Dead animals lay scattered, their bloated carcasses rotting beneath the blistering sun. An apocalyptic scent of death hung in the air. A boulder filled with glittery quartz striations moved closer. “Follow your dreams and experience something amazing,” came the reply. Try as I might, I was unable to catch or stop following my dreams. A few weeks ago, I almost caught one, but it slipped through my fingers and got away from me. Then, last night, I caught a lovely dream I’d been having about badges, marshmallows and Easter bunnies. “Got you!” were my final words. As the cat strutted along the rooftop he followed close in its wake for while the other was quick and sure footed, gliding across the rooftop with an expertise which bespoke of years of experience, he was not. He had followed this rooftop acrobat out of curiosity, but the high wire was not his home; he craved the warmth of his cot and his teddy bear. His eyelids fluttered then opened. “What do you want to do when you grow up?” she said. He shrugged and continued eating his cereal without looking up. He stopped mid shovel and looked up at her. Then, shrugging again, he went back to his feeding frenzy. He knew she was right. He needed to follow his dreams if he was going to make something of himself. Follow your dreams she tells me. That Nadine, she always knows what someone else should be doing: I should mow the lawn; the Bishop’s shouldn’t stay up so late; the Porter’s should get a new car; the Schulte’s should put their daughter on a diet; I should get a haircut. Yes, she has a way, Nadine. I finally took her advice and filed for divorce. Now I live quietly by myself in a small apartment and right now I’m going to roll over and pull the covers up and take some of her oft-offered advice and follow my dreams. She dreamed worlds into being, each word unlocking door after door, and offering new vistas to her bedazzled eyes. Her heart unfolded its wings, stirring the breath of the Eastern Wind, petitioning it to carry her heartfelt desires to the outermost regions of the world. The Key Holder’s hands gently touched the covers of this most special book. She infused it with love and magic of the deepest kind. It was to be a manual for all aspiring dream weavers. For to truly live is to follow your dreams. Such a simple truth but so hard to live by. Karen looked at her daughter sitting on the deck of the large passenger liner. She looked so sweet in her lacy dress and matching sun bonnet. The sudden death of her husband from a massive coronary had been a terrible shock. She had been left to raise this tiny dependent on her own. Her sister, Sandra, who lived in faraway South Africa, had offered to have them live with her. Sandra would look after her daughter during the day while she worked. It was an opportunity. She could reach for her dream of a better life for them both. ‘She’ll NEVER make money as an artist! It’s a hobby, not a career that can sustain her! Plus I’m not wasting the money for her to just lose interest!’ My mother yelled at my father after I asked to join an art class. ‘You can be anything you want in this life. If you want to draw and paint then I’ll go and get what you need. You have real talent Jo. I believe in you,’ my dad gave me a hug and walked away. Years later I’m now a graphic artist, painter, writer because my father supported me. Follow your dreams they said. Go west young man they said. Step out from the crowd. Don’t be afraid, you’re young and strong! All good advice I thought. I was excited and anxious to begin my journey, fulfill my expectations. I left school, my boring job, the comfort of living at home with my parents. I sold my car to buy a bus ticket to California. I packed my duffle bag with the bare necessities. I kept my headphones and cell phone, sold the rest. I boarded the bus with hopeful thoughts, and fell asleep listening to “California Dreamin”. By Charli Mills in Flash Fiction Collections on March 29, 2018 . SO many fantastic flashes inspired by dreams, and YOU Charli!!! Great move to chunk the flashes, Charli. So many but all worth a read. 20 at a time is a good chunk to read and easier to arrange! Sing it, Juliet! Fab, indeed! I like the way you arranged them in chunks, Charli. I read through part one, and today is a workday for me so I’ll be back later to finish the rest. Well done and so many great takes on the prompt. I’m glad that idea worked! 😀 It’s easier for me to arrange, and yet I thought about how the sections connect, too. Fun reads! Wonderful collections of following dreams, Charli. The new format is kinder to the brain. It allows for a leisurely read and no worries about missing any story or having to remember where one left off. That’s exactly what I hoped to accomplish! And that’s also why I want a collection bucket separate from all the comments and links at the Ranch. I started losing my place, too. Now, once everyone adjusts to the form, I can respond to comments without worrying about my collecting chores. The new format is great. Hope it made it easier for you. So many different types of dreams, real, imagined and achieved. And one dream for everyone, seeing their thoughts in print. What a great place to grow. Ha! Well, FB made it difficult, and all the cross-posting was a bit chaotic, but the forms worked great. So this week, I’m anticipating the collection bucket will allow more ease. And I think that is so important — to see our words in print, gathered in concert with other words. It’s rewarding all around. Each week I find it fascinating to read so many different ideas for one prompt word. I greatly enjoy the endless turns of creativity each week!